Sometimes, 2 year olds can be, well, terrible but your 2nd birthday wishes never have to be — especially with the precious birthday messages I have here. Take a stroll through the birthday verses below and choose the one that best expresses what you want to say to the parents of the toddler, not the toddler (since he or she can't even read yet). For more tips on picking the right birthday greetings, take a moment to read the helpful hints here (the tips are for selecting 1st birthday wishes, but also apply to birthday messages for 2 year olds). You've got Zac Efron’s eyes, George Clooney’s smile and Brad Pitt’s face! Basically, you've got it made. Happy 2nd birthday! Happy 2nd birthday! You are twice as wonderful as you were last year! Happy 2nd birthday to my little skipper. Let's row, row, row our boat gently down the hall. Merrily, merrily, merrily, merrily, you have 30 gifts in all. Let’s get out your birthday cake and presents and go CRAZY. It’s time to GET MESSY! Happy 2nd birthday! Although you’re just 2 years old, I’m certain you will be the next Michael Jordan or Tom Brady. Happy 2nd birthday! Today is special. Want to know why? It’s the special day for the most incredible, little <man, darling> in <your country>. Yeah, you! Happy 2nd birthday, cutie pie! Wow, you've been with us for two amazing years. It already looks like you will be a superstar at whatever you decide to do with your life. For now, let’s just eat cake and have a 2nd birthday blast! This is one of my favorite 2nd birthday wishes because it can be from anyone: parents, grandparents, uncles, aunts, even friends. It expresses what most people feel about toddlers in a poetic way. In this way, it's universal in its appeal for the giver and receiver. Need to check out more examples? You've grown so tall in such a short time. Since it’s your special day, you should have a blast every second of it. Have a super happy 2nd birthday! For your special day, just know that I want you to have only the best life can offer, like lots of birthday cake and gifts. Hey, 1 + 1 = 2. You’re 2 today. 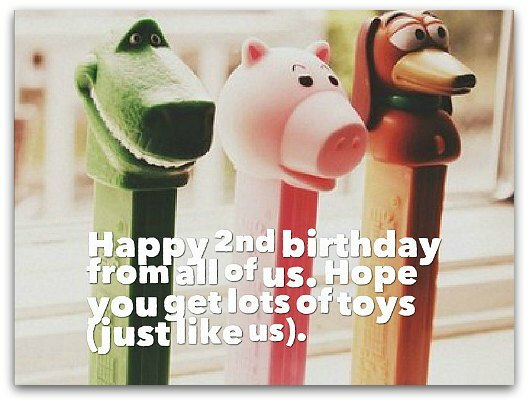 Wow, it’s time to blow out your two birthday candles, eat your 2nd birthday cake (with your fork now) and open your 2nd birthday presents. At 2, you're twice as adorable and precious as you were a year ago. Happy 2nd birthday, cutie pie! 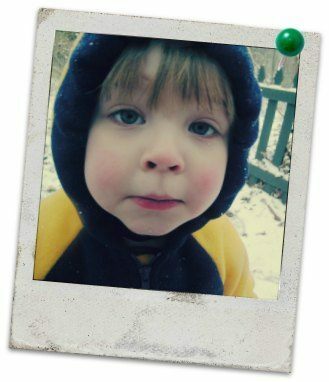 Paging only incredibly amazing, absolutely cute two-year-old <boys, girls> Any here? Yes, I think there’s one right here and <his, her> name is <name>. Happy 2nd birthday! Yo, Little <Man, Missy>, do you know how incredibly cute and precious you are? No? Well, I hereby give you the “Cutie Pie Award” for <year>. Happy birthday. Happy 2nd birthday to a little cutie who makes every day brighter with just a little smile (and more exhausting with the pitter-patter of little feet). Did you know that 2 has always been one of my favorite numbers? Now it’s my absolute FAVORITE…because you turned 2 today. Happy 2nd birthday! On your 2nd birthday, you will have twice the birthday candles, cake, gifts, fun and, yuck, double the hugs and kisses. Happy birthday!